In order to tell the story, I will have to rewind back to when I took time off from college. I came home and was not sure what I wanted to do with my life. My family and friends suggested different career paths, but nothing seemed to spark my interest. One day, my sister said she could see me being a massage therapist. Taking my sister’s suggestion, I looked into massage therapy and found that my personality traits matched that of a massage therapist. I was also excited about the job description because helping others is what I have always wanted to do. Fortunately, I found Clarion-University Venango Campus offered a one year certificate program for massage therapy and I enrolled in August of 2008. While attending school, I worked as the Youth Coordinator at the Oil City YWCA. 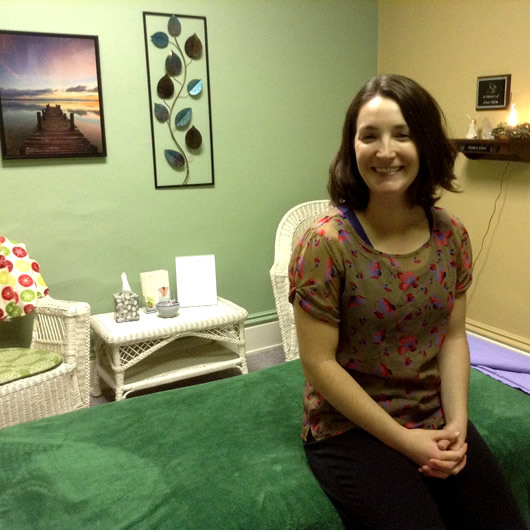 After graduation, I gained experience working at a chiropractor’s office, spa, and occasionally filled in for other massage therapists in the area, all while continuing to work at the YWCA. In 2010, the massage therapist at the YWCA moved on to pursue other opportunities, and she encouraged me to start my own massage therapy practice. Taking her advice, I started my own practice at the YWCA. At the same time, I continued working at the YWCA teaching fitness classes and assisting with the youth department. This summer I decided to focus solely on my massage therapy practice. By doing so, I am able to have set business hours that work for me and my clients. So to answer the question of how I have found success in Venango County, it is this: I have surrounded myself with positive people who encourage and support me. I have learned a lot from the people I have worked with in doing so I have learned a lot about myself. Lastly, I followed my instincts on what feels right. Helping others is what I am passionate about and massage therapy gives me the opportunity to do just that. As I have found success in Venago County, I will continue to stay in the area because Oil City is home to me. My family and friends are here. I have always liked the small town feel, the sense of community, and the natural beauty of the area.